This morning I was shuffling through some stuff and came across the great photo shown above. 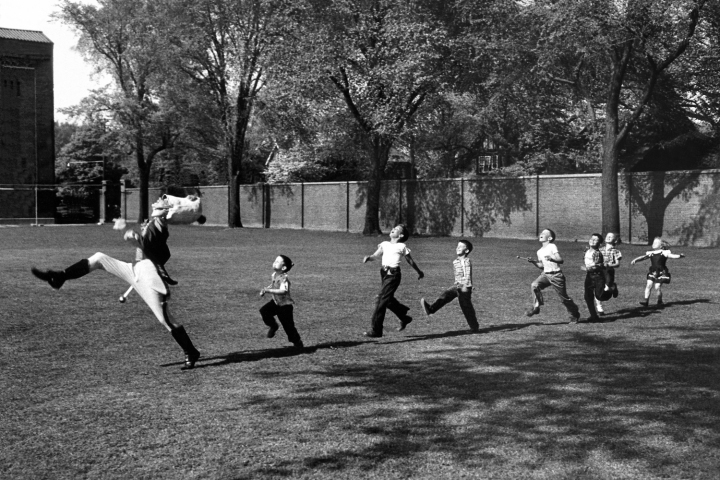 It’s a photo the great photographer Alfred Eisenstaedt took in 1950 of a University of Michigan drum major leading a group of kids across the campus lawn. It has a wonderful effect in that it never fails to make me smile broadly. The joy in those kids mimicking the drum major is palpable. Which brings me to the news that broke last night that a certain person in Washington has given his directive to the Pentagon that they plan for a huge military parade with columns of marching soldiers, tanks and all sorts of armaments flowing down Pennsylvania Avenue in the District of Columbia. At first blush, you might think that sounds great. Why not? Military parades are not part of our national identity and have happened infrequently, the exceptions being at the ends of those wars when we have had citizen troops returning. When you think of such parades, images of those in the Soviet Union, China and North Korea come to mind. These were conceived as shows of strength from these countries but were, in fact, signs of weakness and insecurity. The need for bravado and the flexing of military muscles is meant not so much to impress the outside world. Were we in the US really filled with fear at the sight of tanks and troops marching in Red Square? No, these parades are designed from a stance of weakness and are meant to instill unquestioning, fervent nationalism as well as to stifle dissent within their own countries by showing the absolute might of those in power. And this proposed parade falls into that same category, in my opinion. These shows of strength not who we are and are not necessary. They show our weakness in a pitiful need to conspicuously show the military strength that everyone in the world knows we have. When we spend more than all of the other major powers in the world combined, they know. Not to mention the cost, most likely in the range of a hundred or so million dollars. At a time when we are adding a trillion dollars to the national debt this year, wouldn’t there be better places to direct those funds? Maybe in helping those many, many soldiers suffering with PTSD, post-traumatic stress disorder? I doubt those folks will be marching in these parades. And all to appease the vanity of a weak and needy leader who kowtows to despots and dictators while constantly attacking his own government, a fool who believes that we are somehow constitutionally bound to stand and applaud for him. Nobody can tell me when to stand and when to clap. This ability to defy acts of authoritarianism might be the right that makes me feel truly American. Not some ridiculous military extravaganza. Give me a drum major and a bunch of kids any day. Now, that’s a parade.